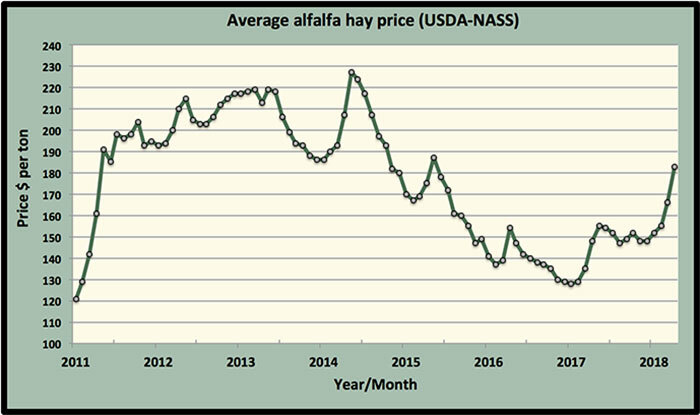 The all-hay and alfalfa hay price averages both moved significantly higher during April based on USDA’s most recent Agricultural Prices report released last week. The all-hay price hit $162 per ton, up $14 per ton from the previous month and $19 higher than April 2017. Hay other than alfalfa moved $1 per ton higher to $124, which is still $7 per ton lower than April 2017. As was the case last month, the market strength for hay is coming from alfalfa. The month-to-month average alfalfa price was up $17 per ton in April to $183 per ton, which is $33 per ton more than one year ago. The alfalfa hay price has moved up $35 per ton since December and the current monthly average price is the highest it’s been since May 2015. As a general rule, annual alfalfa prices peak during April or May. The 2017 peak was in May at $155 per ton, well below the current level. The largest alfalfa price gainers in April were Michigan (up $40 per ton), drought-stricken Oklahoma (up $38), Wisconsin (up $30), Minnesota (up $26), and Ohio (up $20). All statewide price declines were $5 per ton or less. 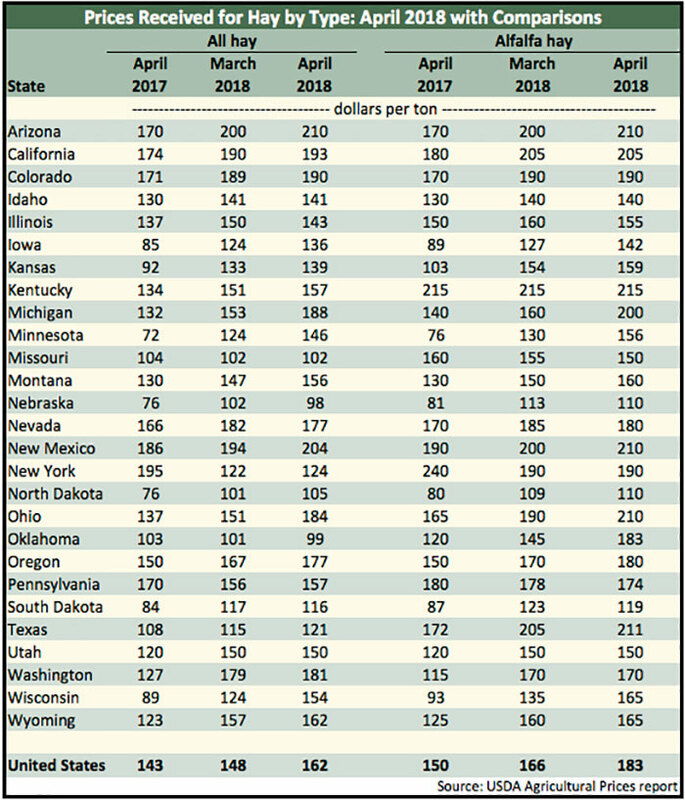 The highest alfalfa hay prices were reported from Kentucky ($215 per ton), Texas ($211), Arizona ($210), New Mexico ($210), Ohio ($210), and California ($205). The lowest prices were found in North Dakota ($110 per ton), Nebraska ($110), and South Dakota ($119).